Channels (top and middle) and runnels (bottom) direct water through hardscape features to other stormwater management facilities. Channels and runnels are concrete or stone lined pathways used to carry rainwater runoff along the surface to other LID features or the sewer system. Runnels are shallow systems usually designed for small spaces and small to moderate flows, while larger and deeper channels are used to collect and carry moderate to large flows. Channels and runnels reduce the need for buried storm drains and carry surface water where underground utility infrastructure prohibits the installation of additional storm drain pipes. They can add aesthetic, artistic, and educational features to a design by highlighting rainfall rather than quickly directing runoff to an underground piped system. Channels and runnels are typically installed by major new development or as part of corridor-wide improvements. They require complex engineering and take up a larger surface area, and are generally not installed by small property owners, tenants, or business owners. They are typically built in coordination with other streetscape and LID features, such as rain gardens, swales or permeable paving, as part of block- or neighborhood-scale projects. Channels and runnels are typically built in coordination with other streetscape and LID features as part of a larger block-scale or neighborhood-scale improvements. They are generally not installed in the right of way by individual small property owners, tenants, or business owners. Materials: Channels and Runnels may be designed with a wide range of materials, including unit pavers, bricks, recycled cobblestone, river rock, concrete, or any durable impermeable material. In highly urban areas, they should be concrete mortared for durability. Accessibility: Where pedestrian crossing or accessibility is required, channels or runnels should be covered with decorative or durable linear trench drain grates, boardwalks, or other ADA-compliant walkable surface at least 4 feet in width. The bottom of the covered channel should be maintained at or below the grade of pre-existing gutter pan to preserve drainage to the storm drain inlet. Runnels are typically designed as an integrated element within streets or plazas. Sizing: Runnels typically range from 10 to 36 inches wide. Materials:They should use contrasting material for aesthetic effect and improved differentiation by people with visual impairments. Slope: Runnels should be designed with a smooth sloping cross section with depths not exceeding 2 to 2-1/2 inches for safety. Runnels should have a gentle slope of between 0.5% and 3% toward the outlet or discharge point. On low volume streets such as alleys, runnels can be combined with infiltration trenches in the center of the roadway to drain runoff through the roadway center. This requires grading and crowning toward the center of the street. Accessibility: Runnelsshould be located so as to minimize crossing of designated ADA pathways or emergency egresses. Where runnels do cross paths of travel, they should include a covered trench drain. 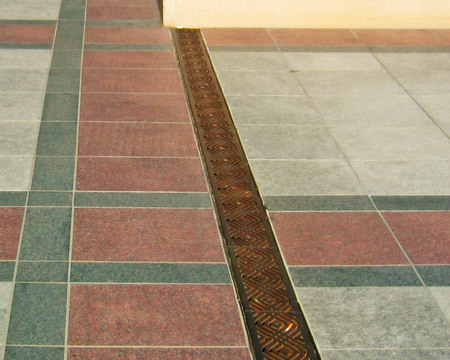 Channels can also be integrated within street or plaza hardscapes for the collection of several small drainage areas. Under most circumstances, channels should have vertical hard sides with hard or natural bottom flow paths. Sizing: Channels are usually deeper than 6 inches. Uncovered portions must be set back a minimum of 2 feet from the sidewalk or curb. Slope: Channels should maintain a minimum slope of at least 0.5%, and the maximum slope in the absence of structural controls should not exceed 6%. Where steeper slopes are present, terraces or check dams should be incorporated into the channel design. Accessibility: Where an uncovered change of level is present within sidewalk or plaza areas, a 4 inch raised curb or border must be incorporated into the design to provide physical separation. Where channels or runnels cross a pedestrian path of travel, a smooth ADA-compliant cover, such as a steel grate or boardwalk, should be part of the design: this configuration is referred to as a covered channel or trench drain. Trench drains may be used on new streets or retrofits to existing streets, at curb extensions, raised crossings, stormwater facilities, curb-less streets (shared or pedestrian-only), or other places where drainage channels are necessary outside of the standard curb and gutter. This treatment may be considered as a potential cost reduction strategy in locations where curb extensions are implemented to allow pre-existing catch basin location to be maintained. They should be used anywhere a channel or runnel crosses the pedestrian path of travel. In many cases, trench drains may be a cost-effective and desirable solution to solve complicated drainage configurations. However, if not properly located and designed, they may present issues with drainage, maintenance, and accessibility. Sizing: Trench drains must be designed to carry the 5-year design storm event within the drain and be able to carry excess storm flow to the downstream inlet. Trench drain grates should be a minimum of 8 inches in width to allow debris to move through the drain and not severely limit the drainage capacity of the drain should debris build up. Slope: Trench drains must maintain standard cross-slope of 2% on the sidewalk for positive drainage. In case of larger storm events or a stopped trench drain, the drainage profile of the site should be designed to drain to nearest gutter or other drainage feature, and away from adjacent properties. Accessibility: Grates or other access panels covering trench drains through curb extensions must be designed, installed and maintained so as not to pose an obstacle or tripping hazard. Channels and runnels are functioning elements of the stormwater infrastructure and must be maintained to serve their required stormwater function. To learn more about who is responsible for maintaining street and sidewalk features, see Funding. Due to the potential for increased maintenance burdens with the use of trench drains, a maintenance plan or agreement with private sponsor should be in place prior to their installation. Trench drains should be regularly cleaned out to allow for free flow of water through the channel.